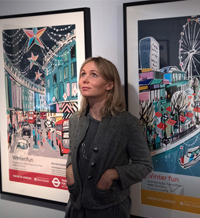 Anna burst onto the London illustration scene after graduating from Central Saint Martins in 2000. Since then, her bold use of colour and stylised graphics have appealed to a wide and diverse client base. About the artist: Anna Hymas is a painter and illustrator who also writes stories. Her work has been shown across the UK and abroad. Since leaving Central Saint Martins College of Art in 2000, she has been represented by New Division & Kids Corner illustration agency and has a list of clients including The National Portrait Gallery, The Sunday Times, The Independent, The Guardian, Soho Create, Penguin Books, DK Books, Oxford University Press, Thomas & Rosenthal ceramics, Terrence Higgins Trust, Science Photo Library, card range for The Art File and posters for the London Underground. Anna has also designed rugs for Loomah, the bespoke carpets and rugs company. Her studio is in East London where she also lives.